Mind maps are a great way to visualise the topic you are trying to study and focus on the specific details. 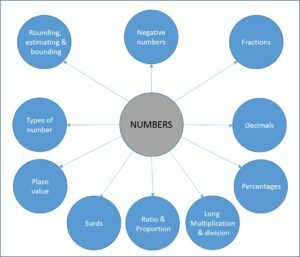 For your GCSE Maths exams this deep understanding is very important, and it’s why many teachers and students recommend using mind maps. Creating the mind maps yourself is time consuming though, and that time could be better spent actually revising. Luckily for you, we have created 46 mind map diagrams to cover the major revision topics that will be on your GCSE Maths exams. These can be used whether you are studying the AQA, Edexcel, or OCR examination board. Studying for your GCSEs can feel daunting because of the large about of information that you need to retain across a variety of subject. This can stress you out, and stress isn’t great for revision and memory. Fortunately, there’s a great study technique called mind mapping, which makes studying for exams interesting, creative, fun and most importantly, effective. Our brains are even more complex and sophisticated than computers, with over a trillion neural connections and 1 000 gigabytes of storage capacity*. So the best way to take in and remember information is to work with our brain. The brain loves to organize information into groups, loves stimulation with colour, patterns, symbols and images, and loves to find links and relationships between information. It’s this power of association and organisation that allows us to hold as much information as we do without having brains the size of soccer balls. Here’s how mind mapping works with your brain for amazing information retention. A mind map starts with a central topic or idea with clusters of related keywords radiating outwards, going into further and further detail. This means you’ve helped your brain organise the information, condense it into memorable keywords, create strong associations and great memory joggers. With an overall picture like this, it’s both quick and easy to extract the information you need in your exam because you’re using multiple neural networks and leveraging things like colour, language, shape and memory processing. Better yet, this information enhances deep learning, meaning it’s not just sticking around in your short-term memory just for the exam. “But I’m not artistic or creative,” we hear you say, “I don’t have the time to create mind maps.” That’s ok. With resources like ours, we’ve created mind maps with all the important GCSE content you could need. The trick to using these resources with maximum benefit is to personalise them by adding your own colours, comments, symbols and patterns, and you can even add in your own information further down the line. What sounds better when revising for your GCSEs? Reading through pages and pages of notes, or having a complete, dynamic mind map with keywords that your brain can process and unzip at lightning speed? *Paul Reber, professor of psychology at Northwestern University.